Booking your parking as part of a hotel package can make huge savings. We compare hotels with parking prices from not just one, but Four of the UK's leading providers including Holiday Extras, Superbreak, APH and FHR. Airport hotels with 8 days parking from only £39. Why Book an Airport Hotel with Parking? Why not combine a stay at the airport the night before your flight with airport parking package. 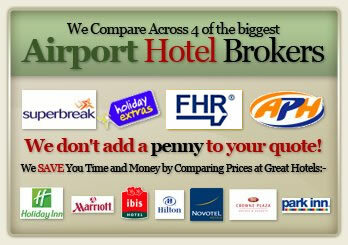 We compare fantastic deals when you combine a airport hotel with car parking package. Include parking packages from just one day to 21 days. You may find, especially during the peak periods over Christmas, Easter and the main 6 weeks school holidays that an airport hotel with parking package can often be cheaper than booking airport parking alone. We compare the prices of over 300 airport hotel and parking combinations, which include on-site parking at the hotel, on and off airport parking plus the increasingly popular meet and greet parking. Below are the various parking options that can be included when you book your airport hotel. Otherwise known as on-site parking, this option allows you to leave your car at the hotel for the duration of your holiday. If the hotel is not connected to the airport, you will need to get a bus transfer often provided by the hotel to the airport. This is where you combine your airport hotel booking with a secure car park which may be on or off-airport. The secure car park will provide a free transfer to and from the airport. We list the actual car parks with each offer so you can decide which to purchase. When this option is chosen your car will be collected from your hotel and taken to a secure car park. Then on your return to the UK your car will be brought to the airport, allowing you to make a swift exit for your onward journey. We offer 37 hotels at Gatwick and amongst our most popular which can include parking are the Gatwick Hilton and Gatwick Sofitel. Both connected to the terminal buildings and offering stylish accommodation and superb restaurants. Choose from 30 hotels at Heathrow airport. When including a parking package it is again the Heathrow Hilton T4 and the Heathrow Sofitel at T5. Both connected to the airport terminal buildings offering luxurious sophistication and excellent value for money. We list 27 hotels at Manchester airport. Again our most popular hotel is connected to the airport. The Radisson Blu is connected to all three terminals via a covered elevated walkway. Enjoy great views in the Phileas Fogg restaurant with floor to cieling windows. At Stansted there are 13 hotels with parking. The Radisson Blu is our most popular package. The hotel has three fabulous restarants, with acrobatic displays in the Angels Wine Tower! There is an on-site health club and in the morning just a short walk to check in, as the hotel is next to the terminal building.